Rotary Valves - R-Cap Process Equipment, Inc. Carbon steel and stainless steel construction. 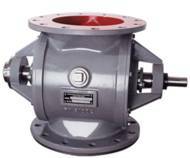 Rotary Valves are precision made with a heavy duty body and rugged fabricated rotor. Designed for use as a feeder valve for dry, bulk materials in applications where close tolerances are necessary in demanding high pressure – high vacuum services. Versatile for use as either a “drop-through” feeder or “conveying valve” with the attachment of a line adapter in pneumatic conveying systems. Various configurations are available including drop-through airlock type with outboard bearings and blow-through type for use in metering material directly into a conveying line and versions.